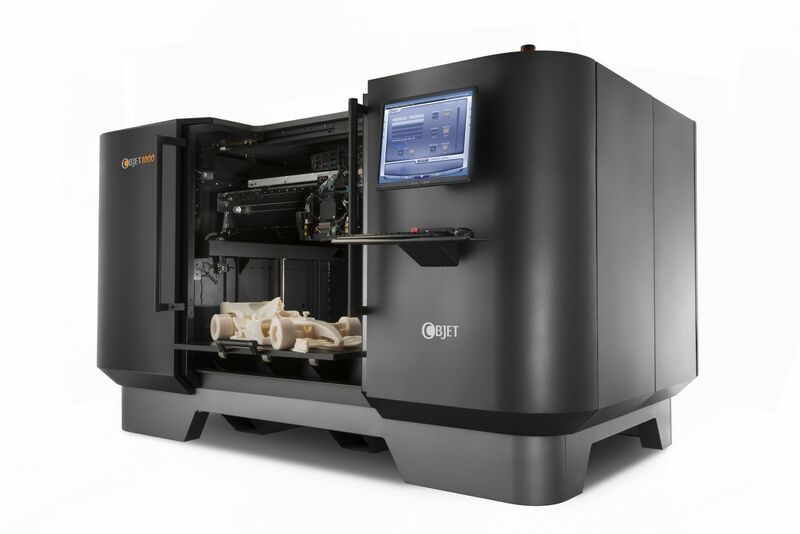 Are There Copyright Concerns with the 3-D Printing Industry? It seems like everything is turning to 3-D technology. From films to visual art to fashion and even human cells, the transformation of art into 3-D has become an increasing phenomenon for good reason. The 3-D printing industry, in particular, has seen rapid growth rates with predictions that it will reach $3.1 billion by 2016. The idea of printing a product on demand in one single process using a digital design is novel. So much that President Obama mentioned 3-D technology in his most recent State of the Union address with respect to improving the manufacturing industry. It increases quality control, creates less waste and is fast. It makes room for innovation, with the ability to create new objects, shapes, and structures that have never been seen before. What is the 3-d Printing Process? It all starts from a single design. The design can be created using CAD design software or scanned using a 3-D scanner. Using a laser beam, a 3-D printer traces the design and instead of printing a flat object, it adds illusion and depth and gives it a shape. The printer uses a material (liquid, powder, plastic, metal) and builds a solid object by adding successive layers of the chosen material until the desired shape is complete. For those of us who do not have experience using CAD design software or a 3-D scanner, printing companies like, Shapeways, Sculpteo, and Thingiverse, makes the process easy for you. All you have to do is upload any design into the online database, choose the desired material you wish to use, and the company manufactures and ships you the finished product. Here, you get a chance to see your design come to life without the extra expense of buying your own printer and materials. Just like the legal battles surrounding the copying of digital music and movie files, users have the same ability to copy and share digital designs and models of 3-D objects. Because many design files are freely accessible throughout the web, it opens up the playing field for infringement of material protected by copyright. The Copyright Act protects “works of artistic craftsmanship [separate and distinct from their utilitarian aspects]”. The copyright laws apply to 3-D printing because it deals with the original author’s creative expression of ideas. Not all digital files are subject to copyright protection, including useful objects. These are objects that are functional and serve a purpose without regard to its design aesthetic. For example, a coffee cup is useful for the purpose of carrying liquids. A coffee cup by itself is not subject to copyright protection and therefore can be printed on a 3-D printer without any infringement issues. But when you add a design to the face of the cup that design is protectable by copyright. As 3-D printing becomes more widespread, the lines between protectable and non-protectable work will become fuzzy. With any other rapidly evolving technology, IP law has a hard time keeping up because there are few cases that can establish legal precedent in those areas. This leaves us with the task of analyzing cases using Copyright Act as the default rule until more specific case law becomes available. Can you prevent every single instance of copyright infringement in 3-D printing? What responsibilities do printing companies have in preventing infringement? What about the Copyright Alert System? Will it prevent against the piracy of 3-D printed digital designs? There are so many questions left unanswered that we’ll being to see the answers to in the upcoming years. 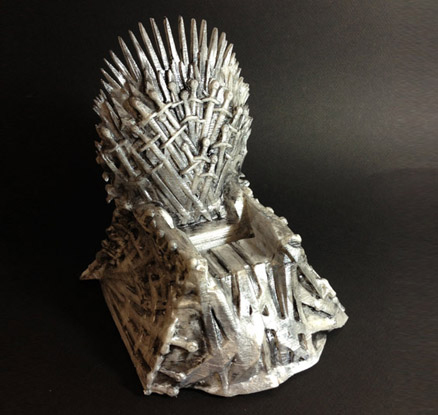 Inspired by the HBO’s Game of Thrones, this iphone docking station was manufactured on a 3-D Printer and created using a CAD design model by NuPRONTO. Due to a cease and desist letter from HBO, NuPronto was forced to pull the item from their site for potential infringement on their copyright. Anaplastologist Jan De Cubber and Belgium Company Materialise collaborated to created a 3-D model of a complex anaplastology case. 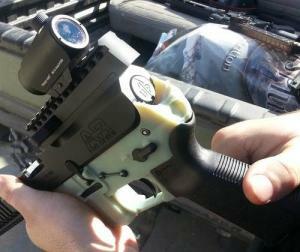 Although controversial and a bit scary, 3-D printers can be used to make guns. Michael Schmidt is a wardrobing and jewelry designer who has garnered the attention of the world’s top entertainers, stylists, photographers and directors for his expertise with a variety of innovative materials and techniques. Michael debuted the World’s First Fully Integrated 3-D Printed Dress last month. With the help of computational designer and architect Francis Bitonti, Schmidt used 3-D software to realize his space-age gown. 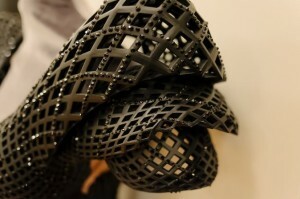 The dress began as a digital rendering, which was then engineered in powdered nylon by high-tech collaborator Shapeways.The body-skimming dress featured an undulating mesh silhouette of three thousand articulated joints fashioned out of layered nylon powder. As if that weren’t complicated enough, it also boasted twelve thousand Swarovski black crystals, which were painstakingly placed by hand after printing.